The competition was formed as the FA Premier League on 20 February 1992 following the decision of clubs in the Football League First Division to break away from the Football League, founded in 1888, and take advantage of a lucrative television rights deal. The deal was worth £1 billion a year domestically as of 2013–14, with BSkyB and BT Group securing the domestic rights to broadcast 116 and 38 games respectively. The league generates €2.2 billion per year in domestic and international television rights. Clubs were apportioned revenues of £2.4 billion in 2016–17. In June 2018, it was announced that Amazon Video would televise 20 games per season in a three-year deal beginning in the 2019–20 season. The telecasts will be produced by a partnership of Sunset + Vine and BT Sport. ^ plus another €5 million in additional bonuses. ^ plus £15 million in bonuses. ^ plus another £12 million in bonuses. ^ reported performance related bonuses of £9 million. ^ plus another £3 million in additional bonuses. Monthly awards are also given for the Manager of the Month, Player of the Month and Goal of the Month. These are also issued annually for Manager of the Season, Player of the Season. and Goal of the Season. ^ When will goal-line technology be introduced? Archived 9 July 2013 at the Wayback Machine The total number of matches can be calculated using the formula n*(n-1) where n is the total number of teams. ^ "United (versus Liverpool) Nations". The Observer. 6 January 2002. Retrieved 8 August 2006. ^ Gibson, Owen (13 June 2012). "Premier League lands £3bn deal". The Guardian. Retrieved 14 June 2012. ^ a b c "Premier League value of central payments to Clubs". Premier League. 1 June 2017. Retrieved 6 June 2017. ^ a b "History and time are key to power of football, says Premier League chief". The Times. 3 July 2013. Retrieved 3 July 2013. ^ "Playing the game: The soft power of sport". British Council. Retrieved 9 October 2018. ^ "Premier League 2014/2015 " Attendance " Home matches". worldfootball.net. Retrieved 30 January 2016. ^ "Bundesliga Statistics: 2014/2015". ESPN FC. Archived from the original on 29 January 2016. Retrieved 18 January 2018. ^ Chard, Henry. "Your ground's too big for you! Which stadiums were closest to capacity in England last season?". Sky Sports. Retrieved 30 January 2016. ^ uefa.com (31 July 2018). "Member associations - Country coefficients – UEFA.com". 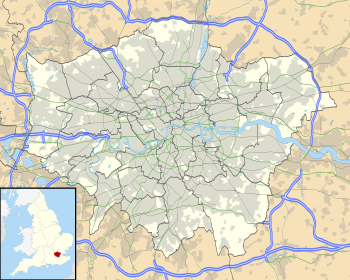 ^ "1985: English teams banned after Heysel". BBC Archive. BBC. 31 May 1985. Retrieved 8 August 2006. ^ a b c d e f "A History of The Premier League". Premier League. Archived from the original on 18 November 2011. Retrieved 22 November 2007. ^ "The Taylor Report". Football Network. Archived from the original on 16 October 2006. Retrieved 22 November 2007. ^ Taylor, Matthew (18 October 2013). The Association Game: A History of British Football. Routledge. p. 342. ISBN 9781317870081. ^ a b Taylor, Matthew (18 October 2013). The Association Game: A History of British Football. Routledge. p. 343. ISBN 9781317870081. ^ a b Crawford, Gerry. "Fact Sheet 8: British Football on Television". Centre for the Sociology of Sport, University of Leicester. Archived from the original on 6 June 2011. Retrieved 10 August 2006. ^ Lipton, Martin (5 October 2017). "Chapter 15: Mr Chairman". White Hart Lane: The Spurs Glory Years 1899–2017. Weidenfeld & Nicolson. ISBN 9781409169284. ^ "Super Ten Losing Ground". New Straits Times. 14 July 1988. Retrieved 9 September 2013. ^ a b c "The History of the Football League". Football League. Archived from the original on 11 April 2008. Retrieved 12 September 2010. ^ a b Conn, David (4 September 2013). "Greg Dyke seems to forget his role in the Premier League's formation". The Guardian. Retrieved 18 January 2018. ^ "The Men who Changed Football". BBC. 20 February 2001. Retrieved 20 December 2018. ^ a b Rodrigues, Jason (2 February 2012). "Premier League football at 20: 1992, the start of a whole new ball game". The Guardian. Retrieved 18 January 2018. ^ MacInnes, Paul (23 July 2017). "Deceit, determination and Murdoch's millions: how Premier League was born". The Guardian. Retrieved 18 January 2018. ^ "In the matter of an agreement between the Football Association Premier League Limited and the Football Association Limited and the Football League Limited and their respective member clubs". HM Courts Service. HM Government. 2006. Archived from the original on 27 September 2007. Retrieved 8 August 2006. ^ Shaw, Phil (17 August 1992). "The Premier Kick-Off: Ferguson's false start". The Independent. Retrieved 24 August 2010. ^ "Final 1992/1993 English Premier Table". Soccerbase. Racing Post. Archived from the original on 24 August 2011. Retrieved 14 September 2010. ^ Lovejoy, Joe (2011). "3. The Big Kick-Off". Glory, Goals and Greed: Twenty Years of the Premier League. Random House. ISBN 978-1-78057-144-7. ^ Northcroft, Jonathan (11 May 2008). "Breaking up the Premier League's Big Four". The Sunday Times. Retrieved 26 May 2011. ^ "The best of the rest". Soccernet. ESPN. 29 January 2007. Retrieved 27 November 2007. ^ "Arsenal make history". BBC Sport. British Broadcasting Corporation. 15 May 2004. Retrieved 16 September 2015. ^ Platt, Oli (11 December 2018). "Arsenal Invincibles: How Wenger's 2003-04 Gunners went a season without defeat". Goal. Retrieved 10 January 2019. ^ "Power of top four concerns Keegan". BBC Sport. British Broadcasting Corporation. 6 May 2008. Retrieved 6 May 2008. ^ "Scudamore defends 'boring' League". BBC Sport. British Broadcasting Corporation. 7 May 2008. Retrieved 9 May 2008. ^ a b "UEFA Champions League – History: Finals by season". UEFA. Retrieved 21 June 2018. ^ "UEFA Europa League – History: Finals by season". UEFA. Retrieved 21 June 2018. ^ a b Jolly, Richard (11 August 2011). "Changing dynamics of the 'Big Six' in Premier League title race". The National. Retrieved 18 August 2013. ^ "Alex McLeish says Aston Villa struggle to compete with top clubs". BBC Sport. British Broadcasting Corporation. 8 September 2011. Retrieved 8 September 2011. ^ Cox, Michael (7 August 2018). "Why can't defending Premier League champions retain the title?". ESPN.com. Retrieved 16 August 2018. ^ De Menezes, Jack (11 May 2016). "Arsenal secure top-four finish for 20th straight season to reach Champions League after Manchester United defeat". Independent. Retrieved 1 June 2016. ^ "Leicester City win Premier League title after Tottenham draw at Chelsea". BBC Sport. 2 May 2016. ^ "Premier League clubs aim to block rich six's bid for a bigger share of TV cash". The Guardian. 27 September 2017. ^ "The changing shape of the Premier League: how the 'big six' are pulling away". The Telegraph. 2 October 2017. ^ "Manchester United remain football's top revenue-generator". BBC Sport. 23 January 2018. Retrieved 13 March 2018. ^ Conn, David (6 June 2018). "Premier League finances: the full club-by-club breakdown and verdict". The Guardian. Retrieved 9 December 2018. ^ a b c Miller, Nick (15 August 2017). "How the Premier League has evolved in 25 years to become what it is today". ESPN. Retrieved 5 July 2018. ^ "Fifa wants 18-team Premier League". BBC Sport. British Broadcasting Corporation. 8 June 2006. Retrieved 8 August 2006. ^ "English Premier League Table – 2007–08". ESPN. Retrieved 11 January 2018. ^ "Our relationship with the clubs". Premier League. Archived from the original on 14 November 2006. Retrieved 8 August 2006. ^ "The Premier League and Other Football Bodies". Premier League. Archived from the original on 18 March 2006. Retrieved 12 September 2010. ^ Nakrani, Sachin (10 June 2008). "Premier League v England time-line". The Guardian. Retrieved 14 September 2010. ^ "Timeline: a history of TV football rights". The Guardian. 25 February 2003. Retrieved 14 September 2010. ^ "Rick Parry says drop in cost of Premier League TV rights 'to be expected'". Eurosport. Press Association. 14 February 2018. Retrieved 13 July 2018. ^ Roan, Dan (13 November 2018). "Premier League: Susanna Dinnage named new chief executive". BBC. Retrieved 13 November 2018. ^ "ECA Members". European Club Association. Retrieved 11 January 2013. ^ "European Club Association: General Presentation". European Club Association. Archived from the original on 9 August 2010. Retrieved 7 September 2010. ^ "Barclays Premier League". Sporting Life. 365 Media Group. Retrieved 26 November 2007. ^ Baxter, Kevin (14 May 2016). "There are millions of reasons to want a promotion and avoid relegation in the English Premier League". Los Angeles Times. Retrieved 11 January 2018. ^ Fisher, Ben (9 May 2018). "Fulham lead march of heavyweights in £200m Championship play-offs". The Guardian. Retrieved 19 July 2018. ^ Wathan, Chris (12 May 2011). "Rodgers looking for his Swans to peak in play-offs and reach Premier League summit". Western Mail. p. 50. ^ "Swansea wins promotion to EPL". ESPN. Associated Press. 30 May 2011. Retrieved 29 June 2013. ^ Herbert, Ian (21 August 2011). "Vorm is man in form to save Swans". The Independent. Independent Print. Retrieved 22 August 2011. ^ "Cardiff Becomes Second Welsh Team in English Premier League". The Sports Network. Associated Press. 16 April 2013. Archived from the original on 10 November 2013. Retrieved 29 June 2013. ^ "Cardiff City relegation: Fans left singing the blues". BBC News. 3 May 2014. Retrieved 11 January 2018. ^ "Premier League: Liverpool finish fourth as Swansea are relegated". BBC Sport. 13 May 2018. ^ "Swans end Bantams fairytale". ESPN FC. 24 February 2013. Archived from the original on 27 February 2013. Retrieved 30 June 2013. ^ "Uefa give Swansea and Cardiff European assurance". BBC Sport. British Broadcasting Corporation. 21 March 2012. Retrieved 24 January 2013. ^ Bose, Mihir (16 August 2001). "Hammam cast in villain's role as Dons seek happy ending". The Daily Telegraph. London: Telegraph Media Group. Retrieved 31 October 2009. ^ "Hammam meets grass-roots on whistle-stop tour". Irish Independent. 23 January 1998. Retrieved 13 June 2013. ^ Quinn, Philip (10 June 1998). "`Dublin Dons on way' Hammam". Irish Independent. Retrieved 13 June 2013. ^ Ziegler, Martyn; Esplin, Ronnie (10 April 2013). "Celtic and Rangers will join European super league, says Scotland manager Gordon Strachan". The Daily Telegraph. London: Telegraph Media Group. Retrieved 21 May 2013. ^ "Premier League clubs' UEFA qualification explained". Premier League. 4 May 2018. Retrieved 6 November 2018. ^ "Country Coefficients 2017/18". UEFA.com. ^ "Liverpool get in Champions League". BBC Sport. British Broadcasting Corporation. 10 June 2005. Retrieved 11 December 2007. ^ "Jubilant Chelsea parade Champions League trophy". CNN International. 21 May 2012. Retrieved 11 January 2013. ^ a b "Sao Paulo FC – Liverpool FC". Fédération Internationale de Football Association. 18 December 2005. Retrieved 6 March 2013. ^ "Real Madrid presented with the FIFA World Champions Badge". Fédération Internationale de Football Association. 16 December 2017. Retrieved 28 June 2018. ^ "Corinthians – Vasco da Gama". Fédération Internationale de Football Association. 14 January 2000. Retrieved 6 March 2013. ^ "Sport Clube Internacional – FC Barcelona". Fédération Internationale de Football Association. 17 December 2006. Retrieved 6 March 2013. ^ "Boca Juniors – AC Milan". Fédération Internationale de Football Association. 16 December 2007. Retrieved 6 March 2013. ^ "Barclays nets Premier League deal". BBC News. BBC. 27 September 2006. Retrieved 7 September 2010. ^ "Barclays renews Premier sponsorship". premierleague.com. Premier League. 23 October 2009. Archived from the original on 25 October 2009. Retrieved 23 October 2009. ^ "Premier League closes door on title sponsorship from 2016 to 2017 season". ESPN FC. Press Association. Retrieved 7 June 2015. ^ "Partners". premierleague.com. Premier League. Archived from the original on 13 August 2010. Retrieved 7 September 2010. ^ Northcroft, Jonathan (4 October 2009). "The Premier League's goal rush". The Sunday Times. Retrieved 7 September 2010. ^ "Premier League wages keep on rising, Deloitte says". BBC News. British Broadcasting Corporation. 9 June 2011. Retrieved 13 August 2012. ^ "English Premier League generates highest revenue, German Bundesliga most profitable". The Observer. Guardian News and Media. 10 June 2010. Retrieved 20 September 2010. ^ Jakeman, Mike (25 March 2015). "Unbelievably, the Premier League is becoming profitable". Quartz (publication). Retrieved 25 March 2015. ^ "Prestigious Award for Premier League". Premier League. 21 April 2010. Archived from the original on 22 April 2010. Retrieved 21 April 2010. ^ "Top 20 clubs Deloitte Football Money League 2011". Deloitte. Archived from the original on 30 November 2012. Retrieved 22 January 2013. ^ "Deloitte Football Money League 18th Edition" (PDF). January 2015. p. 3. Archived from the original (pdf) on 22 January 2015. Retrieved 14 November 2015. ^ Austin, Simon (18 December 2012). "Premier League clubs agree new cost controls". BBC Sport. British Broadcasting Corporation. Retrieved 8 July 2013. ^ Blythe, Nils (2 March 2010). "Why TV is the key to Real success". BBC News. BBC. Retrieved 14 September 2010. ^ "Frequently asked questions about the F.A. Premier League, (How are television revenues distributed to Premier League clubs?)". Premier League. Archived from the original on 26 November 2007. Retrieved 11 December 2007. ^ Harris, Nick (23 March 2010). "Premier League nets £1.4bn TV rights bonanza". The Independent. Retrieved 12 September 2010. ^ a b "BSkyB Timeline". BSkyB. Retrieved 20 October 2009. ^ "Premier League launches international rights tender". SportBusiness. SBG Companies Ltd. Retrieved 12 September 2010. ^ "BBC keeps Premiership highlights". BBC Sport. British Broadcasting Corporation. 8 June 2006. Retrieved 8 August 2006. ^ Bond, David (26 May 2006). "TV deal pays another £84m". The Daily Telegraph. Retrieved 8 August 2006. ^ "Premiership in new £625m TV deal". BBC News. BBC. 18 January 2007. Retrieved 3 June 2007. ^ "Premier League clubs benefit from new overseas TV deal". BBC Sport. British Broadcasting Corporation. 30 March 2010. Retrieved 11 September 2010. ^ Harris, Nick (12 January 1999). "Football: High Court countdown: Battle begins for football's future". The Independent. Retrieved 11 September 2010. ^ "BSkyB investigation: alleged infringement of the Chapter II prohibition" (PDF). Office of Fair Trading. HM Government. 17 December 2002. Archived from the original (PDF) on 23 August 2006. Retrieved 11 September 2010. ^ "Sport and European Competition Policy" (PDF). European Commission Directorate-General IV – Competition. 1999. Archived from the original (PDF) on 23 August 2006. Retrieved 8 August 2006. ^ "BBC renews Match of the Day deal". BBC Sport. British Broadcasting Corporation. 25 May 2012. Retrieved 25 May 2012. ^ "New Television Rights". BBC News. BBC. 6 February 2009. Retrieved 6 January 2010. ^ "ESPN win Premier League rights". Premier League. 22 June 2009. Archived from the original on 24 June 2009. Retrieved 22 June 2009. ^ "Premier League rights sold to BT and BSkyB for £3bn". BBC News. 13 June 2012. ^ "Premier League TV rights: Sky and BT pay £5.1bn for live games". BBC Sport (British Broadcasting Corporation). 10 February 2015. Retrieved 10 February 2015. ^ "The Premier League Football Show". BBC. August 2016. ^ "Premier League TV rights: Amazon to show 20 matches a season from 2019-2022". BBC News. 7 June 2018. Retrieved 24 March 2019. ^ "Amazon's Premier League production goes to BT and Sunset+Vine". SportsPro Media. Retrieved 24 March 2019. ^ Flanagan, Chris (19 January 2016). "Inside Premier League Productions: the company you know nothing about servicing 730m homes every matchday". FourFourTwo. Retrieved 9 August 2018. ^ "ESPN-Star extends pact with FA Premier League". Business Line. 21 March 2004. Retrieved 9 August 2006. ^ Siracusa, Claire (3 November 2015). "Optus snatches English Premier League rights from Fox Sports in Australia". The Sydney Morning Herald. Retrieved 14 January 2017. ^ "Super Sports Media Group acquires Premier League rights in China". PremierLeague.com. London. Archived from the original on 19 August 2014. Retrieved 17 August 2014. ^ "Canada's Sportsnet and TSN to Share English Premier League Rights". The Hollywood Reporter. Retrieved 29 December 2014. ^ "English Premier League gets a big American stage on NBC". The Washington Post. Retrieved 17 August 2014. ^ a b Paulsen (28 May 2015). "Premier League Viewership Up in Year Two on NBC". Sports Media Watch. Retrieved 12 August 2015. ^ Yoder, Matt (11 August 2015). "NBC AND THE ENGLISH PREMIER LEAGUE WILL CONTINUE THE BEST MARRIAGE IN SPORTS MEDIA". Awful Announcing. Retrieved 12 August 2015. ^ Rashid, Saad (28 July 2015). "NBC Sports deserves new Premier League rights deal". World Soccer Talk. Retrieved 12 August 2015. ^ "NBC retains Premier League rights until 2021–22 season". ESPN FC. 10 August 2015. Retrieved 12 August 2015. ^ Sandomir, Richard (10 August 2015). "NBC Retains Rights to Premier League in Six-Year Deal". The New York Times. Retrieved 13 August 2015. ^ Conn, David (10 May 2006). "Rich clubs forced to give up a sliver of the TV pie". The Guardian. Retrieved 8 August 2006. ^ Brewin, John (4 July 2005). "1997/98 – Season Review". Soccernet. ESPN. Retrieved 29 November 2007. ^ "Premier League's relegated clubs to receive £60m boost". ^ Collins, Paul (26 April 2013). "Hull set for £120m cash windfall if they win promotion to Premier League". Daily Mail. ^ "Richard Scudamore takes big stick to Championship over parachute money". ^ James, Stuart (5 August 2006). "Why clubs may risk millions for riches at the end of the rainbow". The Guardian. Retrieved 13 August 2006. ^ Bailey, Ben; Whyte, Patrick (19 March 2009). "Premier League casualties – clubs that have struggled since relegation". Evening Standard. Daily Mail & General Trust. Archived from the original on 22 March 2009. Retrieved 7 April 2009. ^ "Down again: Leicester's relegation horror". The Daily Telegraph. 5 May 2008. Retrieved 7 April 2009. ^ "What's new this season: Stadiums". Premier League. 4 August 2017. Retrieved 28 December 2017. ^ Fox, Norman (18 April 1999). "Football: Fayed's race against time". The Independent. Retrieved 14 September 2010. ^ Slater, Matt (14 March 2007). "Call grows for return of terraces". BBC Sport. British Broadcasting Corporation. Retrieved 28 May 2009. ^ Whyatt, Chris (3 January 2008). "Match-going mood killers?". BBC Sport. British Broadcasting Corporation. Retrieved 15 September 2010. ^ a b Prince-Wright, Joe (8 August 2017). "Where are all 20 Premier League teams located?". NBC Sports. Retrieved 28 December 2017. ^ "Premier League Handbook: Season 2017/18" (PDF). Premier League. p. 4. Retrieved 28 December 2017. ^ Buraimo, Babatunde; Simmons, Rob (2006). "Market size and attendance in English Premier League football" (PDF). Lancaster University Management School Working Paper. Lancaster University Management School. 2006/003. Retrieved 4 January 2018. ^ "Premier League Handbook: Season 2017/18" (PDF). Premier League. p. 593. Retrieved 28 December 2017. ^ "Football Stats Results for 1992–1993 Premiership". football.co.uk. DigitalSportsGroup. Archived from the original on 2 January 2007. Retrieved 10 August 2006. ^ "Fact Sheet 2: Football Stadia After Taylor". University of Leicester. Archived from the original on 26 June 2006. Retrieved 10 August 2006. ^ "Shifting stands". Soccernet. ESPN. 27 July 2005. Retrieved 10 August 2006. ^ "United Kingdom: Deloitte Annual Review Of Football Finance Highlights". Deloitte Sports Business Group. Mondaq. 4 June 2008. Retrieved 7 September 2010. ^ "Premier League records highest average attendance". Daily Mail. Daily Mail. 2 June 2014. Retrieved 14 January 2015. ^ Kelly, Seamus; Harris, John (2010). "Managers, directors and trust in professional football". Sport in Society: Cultures, Commerce, Media, Politics. 13 (3): 489–502. doi:10.1080/17430431003588150. ^ White, Duncan (5 December 2005). "The Knowledge". The Daily Telegraph. Retrieved 13 October 2010. ^ Hughes, Matt; Samuel, Martin (22 September 2007). "Avram Grant's job under threat from lack of Uefa licence". The Times. Retrieved 8 November 2010. ^ "Longest serving managers". League Managers Association. Archived from the original on 7 February 2015. Retrieved 14 September 2010. 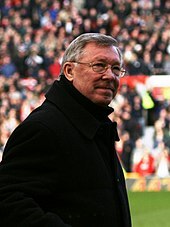 ^ "Soccernomics: Does sacking the manager actually make a difference?". FourFourTwo. 13 March 2016. Retrieved 14 December 2017. ^ "Barclays Premier League Statistics". Premier League. Retrieved 20 February 2018. ^ Atkinson, Ron (23 August 2002). "England need to stem the foreign tide". The Guardian. Archived from the original on 15 February 2012. Retrieved 10 August 2006. ^ Ingle, Sean (12 June 2001). "Phil Neal: King of Europe?". The Guardian. Retrieved 10 August 2006. ^ "Wenger backs non-English line-up". BBC Sport. British Broadcasting Corporation. 14 February 2005. Retrieved 10 August 2006. ^ Williams, Ollie (17 August 2009). "Where the Premier League's players come from". BBC Sport. British Broadcasting Corporation. Retrieved 3 October 2010. ^ "New Work Permit Criteria for Football Players Announced". Department for Education and Employment. HM Government. 2 July 1999. Archived from the original on 30 September 2007. Retrieved 1 July 2007. ^ "Work permit arrangements for football players". Home Office. HM Government. Archived from the original on 26 September 2006. Retrieved 1 July 2007. ^ "Premier League rules" (PDF). Premier League. 2010. p. 150. Archived from the original (PDF) on 6 March 2009. Retrieved 7 September 2010. ^ a b "Home Grown Player rules". Premier League. 16 July 2010. Archived from the original on 13 August 2010. Retrieved 5 August 2010. ^ "New Premier League squad rules explained". BBC Sport. British Broadcasting Corporation. 27 July 2010. Retrieved 5 August 2010. ^ "Forty factors fuelling football inflation". The Guardian. 31 July 2003. Retrieved 8 August 2006. ^ "Global Sports Salaries Survey 2018". Sporting Intelligence. 27 November 2018. Retrieved 27 November 2018. ^ "From £250,000 to £29.1m". The Observer. 5 March 2006. Retrieved 2 December 2007. ^ "United Sign Pogba". Official Manchester United Website. Retrieved 8 August 2016. ^ "Romelu Lukaku: Man Utd sign Everton striker for initial £75m on five year deal". BBC Sport. 10 July 2017. ^ "Virgil van Dijk: Liverpool to sign Southampton defender for world record £75m". BBC Sport. BBC.com. Retrieved 28 December 2017. ^ "Kepa arrives at Chelsea". Chelsea F.C. 8 August 2018. Retrieved 8 August 2018. ^ a b Jamie Jackson (10 July 2018). "Manchester City seal £60m deal for Leicester's Riyad Mahrez" (Press release). The Guardian. ^ "Morata is a Blue". chelseafc.com. 21 July 2017. Retrieved 22 July 2017. ^ "Philippe Coutinho: Liverpool agree £142m deal with Barcelona for Brazil midfielder". BBC Sport. British Broadcasting Corporation. 6 January 2018. Retrieved 6 January 2018. ^ "Bale transfer fee revealed". FIFA.com. 15 October 2013. Retrieved 15 October 2013. ^ "Premier League player stats". Premier League. Retrieved 11 November 2018. ^ Whooley, Declan (23 December 2013). "Will Luis Suarez break the Premier League goal scoring record this season?". Irish Independent. Retrieved 15 August 2014. ^ "Players by Statistic". Premier League. Retrieved 20 August 2013. ^ "Torres wins Barclays Golden Boot landmark". Premier League. 26 November 2009. Archived from the original on 11 June 2010. Retrieved 11 September 2010. ^ "Premier League records". football.co.uk. DigitalSportsGroup. 24 March 2008. Archived from the original on 1 December 2009. Retrieved 13 September 2010. 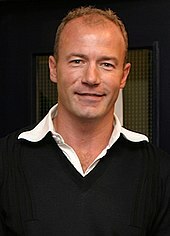 ^ "Ryan Giggs goal makes him only person to score in all PL seasons trivia". SportBusiness. SBG Companies Ltd. Retrieved 21 November 2009. ^ "Is there more than one Premier League trophy?". Premier League. Archived from the original on 29 April 2014. Retrieved 29 April 2014. ^ Rumsby, Ben (28 April 2014). "Premier League consider borrowing a championship trophy as season heads for three-way climax". The Telegraph. Retrieved 29 April 2014. ^ "Size and weight of the Barclays Premier League trophy". premierleague.com. Premier League. 12 March 2010. Archived from the original on 12 January 2016. Retrieved 16 May 2012. 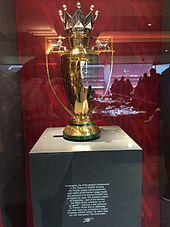 ^ a b "The Premier League Trophy". Premier Skills. British Council. Retrieved 22 January 2013. 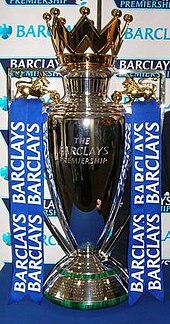 ^ "What makes the Barclays Premier League Trophy so special?". Barclays. Archived from the original on 22 November 2010. Retrieved 13 September 2010. ^ "Special trophy for Gunners". BBC Sport. 18 May 2004. Retrieved 20 August 2017. ^ "Season review 2009/10". Premier League. 13 May 2010. Archived from the original on 16 May 2010. Retrieved 15 September 2010. ^ Neale, Richard (7 May 2010). "Tottenham Hotspur's Sir Harry Redknapp is Premier League manager of season". The Times. Retrieved 15 September 2010. ^ "Rooney named Barclays Player of the Season". The Independent. 10 May 2010. Retrieved 7 August 2011. ^ "New Premier League player award announced". Premier League. 18 April 2018. Retrieved 16 May 2018. ^ "Chelsea scoop hat-trick of Barclays awards". Premier League. 13 May 2010. Archived from the original on 16 May 2010. Retrieved 15 September 2010. ^ "Premier League Milestones celebrate players' success". Premier League. 24 April 2018. Retrieved 16 May 2018. ^ "20 Seasons Awards: The Winners". premierleague.com. Premier League. 15 May 2012. Archived from the original on 18 May 2012. Retrieved 15 May 2012.